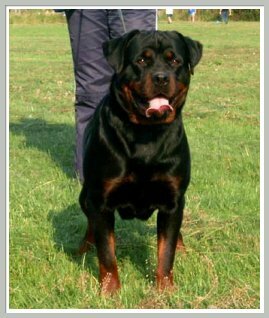 INT CH AKIRA VOM GROSSEN TAL - A.K.A - THE ROTTWEILER PUPPIES "CHAMPION FACTORY"
Characteristics: Akira is powerfully built with distinct features and strong heavy bone structure. Her headpiece is extremely large and typey, possessing a lot of cheek and perfect angulations. Her markings and coloration are the richest mahogany that you could ask for with lines that look like they were sharply drawn on her coat with a magic marker. She is literally perfectly put together, with every body part in exact proportion to all other relevant parts of her conformation. Because of this her movement is second to none, with not an ounce of wasted energy lost at any given time. I would like to say a special thank you to Alex at Vom Grossen Tal for all of his help and for entrusting this wonderful female to Atlanta Haus Rottweilers, as well as her beautiful daughter Jodie Vom Grossen Tal. Akira is by far one of the best female examples of the breed that we have been fortunate enough to be around. Her jaw dropping good looks are just the tip of the iceberg pertaining to her worth to our kennel. Akira has a mind like one of your peers and physical abilities that make you think twice about what a dog is capable of. She is a perfect lady in family and social situations; while still possessing the strong protection drives that we rely on. She passes these working and conformation features on consistently to her offspring, as is evident by the three multi country champions she has produced in her first three litters as well as many V rated and CAC pups. Her daughter Jodie Vom Grossen Tal (Figo Vom Grossen Tal x Akira Vom Grossen Tal) is our favorite young dog that we have ever owned at Atlanta Haus Rottweilers, and we couldn't possibly be any more excited about the prospects for Akira's future litters. Pedigree Analysis: Akira has a world class pedigree with 10 out of 14 relatives on her three generation pedigree as INT, Dt. VDH, single, or multi country conformation champions. Furthermore, Akira's pedigree is well rounded and provides a balanced canvas for producing working and conformation champion puppies from a large, varied list of possible sires. She is line bred top and bottom on Chris Vom Obergrombacher Schloss as well as Falko Vom Sittard who is out of Norris Vom Gruntenblick, and Cita Vom Sittard, a Benno Von Der Schwarzen Heide daughter. 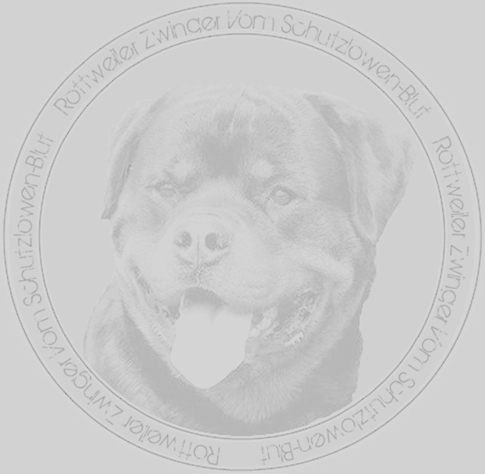 Akira's maternal grandsire Dollo Vom Haus Nagy is from a line breeding on Benno Von Der Schwarzen Heide and Norris Vom Gruntenblick, via his sire is Hoss Vom Gluckstern, an international champion son of Rick Von Burgthann. Akira's bottom side dams are out of a combination of Matcho Von Burgthann, Flash Vom Wulfurt Turm, and Chris Vom Obergrombacher Schloss. Akira's topside pedigree is bred for huge heads, athletic ability, and intellect. Her sire Falco Junior Montagna II is out of Falko Vom Sittard son, and Dingo Vom Schwinger Wappen line bred product, Joker Von Junipera. Falco's dam, Burga, is top and bottom line bred Dingo Vom Schwinger Wappen. This kaleidoscope of champion working and show lines and powerful line breedings generations back are what make Akira such an amazing producing female and champion. 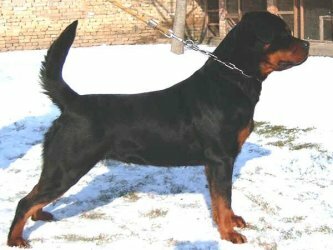 Alex Gagic, from Vom Grossen Tal rottweilers, is a true genius at breeding well rounded pedigrees with line breedings four and five generations back, so as to promote growth of these magnificent lines as opposed to negatively impacting the physical and mental soundness of the rottweiler breed by over breeding too close up. Here in the States we could all learn a sound lesson from his time tested exemplary results. His dogs, as well as past dogs from his breeding, can be viewed at www.vomgrossental.com. 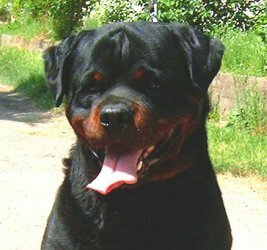 One of the newest sensations from his kennel's masterful breeding, Figo Vom Grossen Tal, can be viewed at www.redwoodkrest.com/rottweilers/males/Figo/index.html.